The idea of making these vegan fish fingers came to me while I was trying to figure out what to bring to a family gathering. I wanted to recreate a vegan version of everything my family would be eating and was determined to show them that there are other options out there. So, pleased with myself for taking up this challenge I got to work and started experimenting. While looking for ingredients I stumbled across a can of artichoke hearts in my pantry and the rest followed. I fried some onions, leek, garlic, added in the chopped artichokes and seasoned well with sea salt and pepper. I blended them in my food processor, then added nutritional yeast and chickpea flour, and gave my mixture a quick mix. Now, my mixture looked, and tasted amazing, but it wasn’t enough to make the omnivores curious to try! And that’s what I was aiming for. So, I went to the garden and picked a few mint leaves and dill stems, because you can never have enough dill in your life. 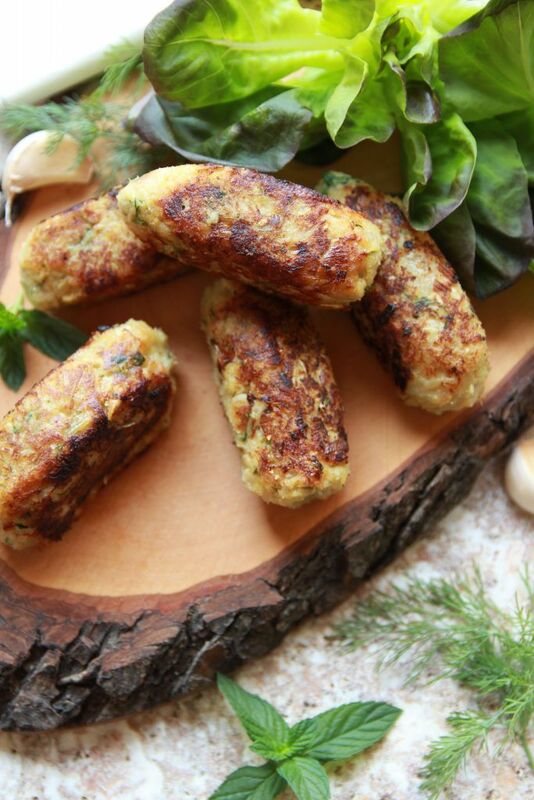 Back in my kitchen, I finely chopped the greens, formed my mixture into fishless fish cake fingers, heated up a pan with a dash of peanut oil and fried them. Dice the artichoke hearts, finely slice the celery, and set aside. Wash, peel and finely dice the onion, thinly slice the leek, and crush the garlic cloves. Heat a pan on medium heat then add the peanut oil, along with the onion and leek. Fry for a couple of minutes, occasionally stirring, until the onion starts to brown. Next, add the garlic, celery and artichokes and cook for a couple of minutes. Turn off the heat, add a pinch of sea salt and black pepper, or according to taste, then transfer into a food processor and blend until well combined. Transfer your mixture into a bowl, add the chickpea flour and nutritional yeast and mix until combined. 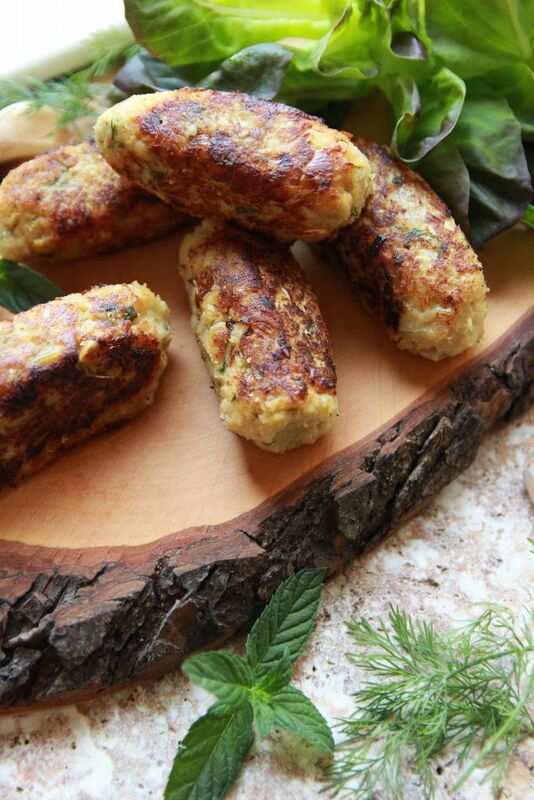 Wash and finely chop the fresh dill and mint, add it to the fishless cakes, and give it a quick mix. The mixture will be quite wet, and will stick to your hands a bit, but that’s exactly how it should be. You can place it in the fridge for 20 minutes or so to firm up a bit, or immediately continue to the next step. 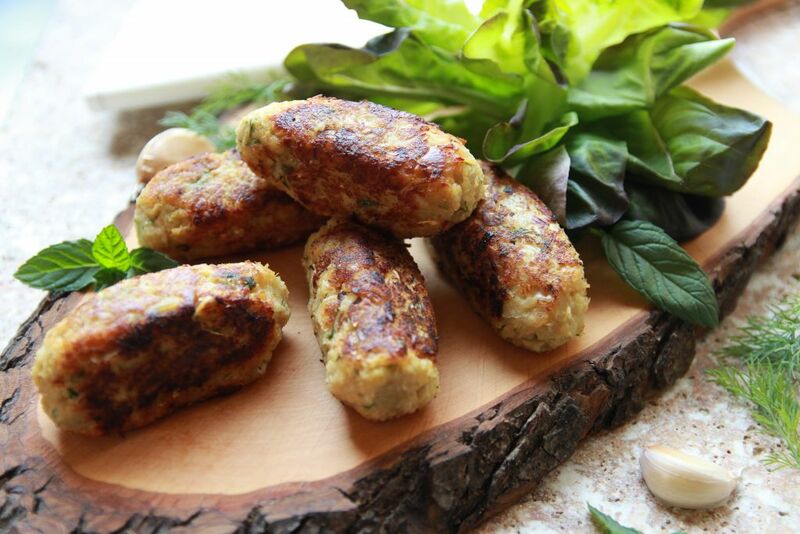 Form 6 vegan fish cakes, or fingers, reheat the pan, then add a drizzle of peanut oil and gently place the fingers in the pan. Fry well on all sides, using tongs to flip them onto each side, until golden brown. Transfer onto a plate with a paper towel. Serve with a few greens, on its own, or in a sandwich. It’s up to you. And if you have any leftovers, they can be stored in the fridge for up to a week. 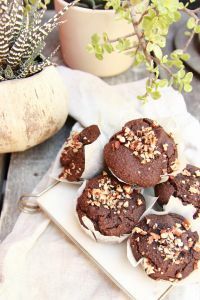 If you haven’t already tried my gluten free, moist, chocolaty, oil free, refined sugar free Vegan Chocolate Muffins, then it’s about time you do. Trust me, you’ll thank me later. ← Hearty Chunky Vegan Couscous! Good morning I watch you on I/24news. Very impressed everything looks good where would I buy the Products . Are the artichokes marinated or in water? What can I use in place of chickpea flour? Hi, just made these. The mixture turned out really wet…? I added more flour and have put the batter in the fridge to firm up. Is it an 180g jar of artichoke hearts or 180g of artichoke hearts, out of the jar..? mmm mmmm mmmm. excited to make it tonight!!! Hi this recipe ( and actually your whole page) looks great! Would like to pre make the mix one day in advance, do you think that would be okay? And if i wanted to upgrade the salad going with the fish fingers to make it a ‘complete’ starter, are there any things you would recommend? Yes sure, I’ve made the mix in advance many times and then just fry fresh the day I’m serving them. You can make a big leafy salad, add toasted almonds, pistachios, dried cranberries, and make a quick garlic, lemon, mustard and olive oil dressing. Or just keep the dressing simple, adding lemon juice and olive oil.